This MW5-LD2 digital stereo zoom microscope connects directly to the computer via the USB 2.0 port. The digital microscope includes software for capturing both still and moving images, making measurements and adjusting exposure. Objective Lenses: 1x - 4x objectives provide a zoom range from 10x - 40x when using the included 10x eyepieces. Eyepieces: Widefield 10x eyepieces are 45° inclined, with dual diopter adjustments, interpupillary adjustment from 55mm to 75mm. Total Magnification: Continuous zoom range of 10x-40. Magnification can be adjusted by adding an auxiliary lens (see chart below). Specimen Stage: Large 165mm wide x 220mm deep stage surface. Includes two 80mm stage plates (reversible black/white plastic contrast plate and frosted glass), blue filter for transmitted light and locked on stage clips. Stand: Mounted on a metal heavy duty post stand, microscope head extends to 17" for higher objects. Focusing: Large dual focusing knobs with slip clutch to prevent damage to mechanism. Tension adjustment eliminates focus “drift”. Illumination: Top light is 12v 15 watt halogen, bi-pin with directional beam and rheostat control. Bottom light is 12V 10 watt halogen, bi-pin. Lights operate together or independently. Size & Weight: 13" high, extends to 17" for taller objects, 11.2 lbs. Warranty: Lifetime limited warranty. Camera has a 1-year warranty. Software has 90-day warranty. 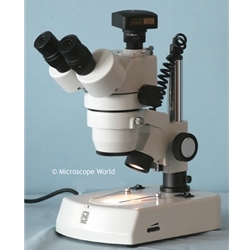 Includes: Microscope, c-mount, camera and software. 3.2 mega pixel camera built into microscope. Connects to computer via USB 2.0 Port - self-powered through computer. Captures moving images at 18 frames per second @ 800x600, 8fps @ 1600x1200. Effective pixels 2048 x 1536. Images can be captured and saved as either .jpg, .bmp or .mig files.